S.S. JOHN W. BROWN has a long history of working with different Scout programs including the Boy Scouts of America, Sea Scouts and Girl Scouts. Scout units can spend the weekend onboard the ship and engage in various activities. There are 13 total Merit Badges available to be earned on the ship. If you would like to bring a troop for a weekend, please contact the ship through one of the avenues below. We've also had home school groups and church groups utilize the ship, as well. If you'd like more information, please contact the ship. PLEASE NOTE: Our home berth, Pier 1 South Clinton Street is having the warehouse taken down. The ship was moved to temporary pier in October 2016. The temporary pier is a secure pier which means we cannot not have visitors or overnights. When we are able to move back to Pier 1, there are a lot of items we have to put in place to have a safe environment before we can have youth groups aboard. We are not planning any youth activities through the end of the year 2017. We will update the website when we know more. In 2013, the ship instituted a STEM (Science, Technology, Engineering, and Math) Internship program in cooperation with a local county school system. 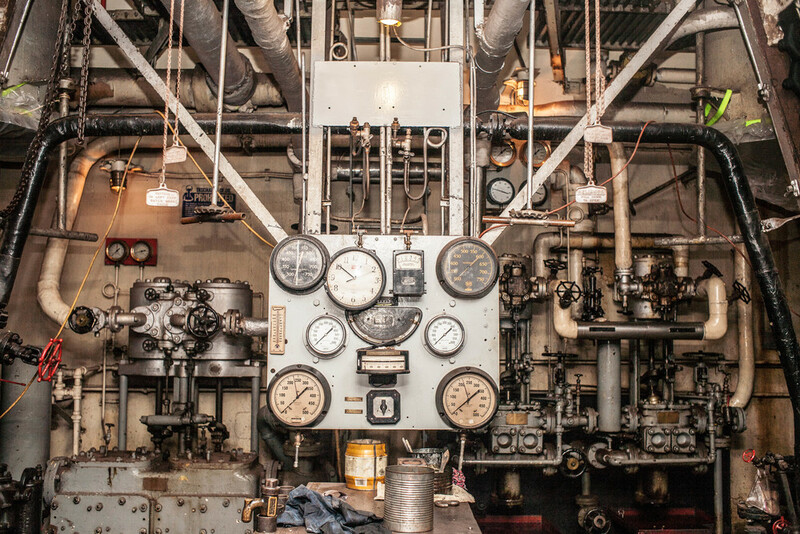 Five seniors from North County High School in Glenn Burnie, Maryland, were the first students to participate in the program that offers a unique exposure to the STEM principles found in the steam engineering plant on the Liberty ship S.S. JOHN W. BROWN. The internship included "hands on" work maintaining and operating the ship's machinery as well as guided instruction in the ship's systems through the use of written exercises and mentors. This is a particularly valuable and beneficial educational opportunity for those students interested in attending the Naval Academy, the Coast Guard Academy, or one of the merchant marine academies. Interns will work with navy and merchant marine veterans and gain insight into ship maintenance and operations. Space is limited. Contact your school’s STEM facilitator to apply. For students not enrolled in a STEM program at school and who are interested in learning more about these educational opportunities on S.S. JOHN W. BROWN, click on the link below and enter "STEM" in the message block on the request form.